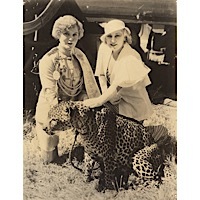 Mabel Stark in an undated photo with an adolescent leopard. Stark’s life has been lovingly recounted by filmmaker Leslie Zemeckis in a new documentary titled: Mabel, Mabel, Tiger Trainer. New York, NY: The idea of keeping big cats in a cage is quickly falling out of fashion. But a century ago, when the traveling circus was reaching its storied apex, crowds flocked by the thousands to see the magnificent beasts and the men who dared to train them. Into this world stepped a woman named Mary Haynie – a sideshow “cooch” dancer who was absolutely smitten the fist time she locked eyes with a tiger. Mary would eventually assume the persona of Mabel Stark, join the circus as an animal trainer, and – in the process of breaking down walls – become a living legend. Filmmaker Leslie Zemeckis has crafted an astounding documentary about the life of Mabel Stark. 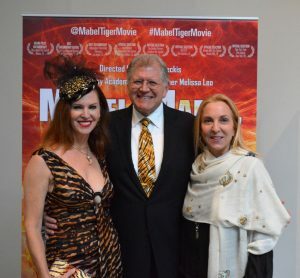 Titled “Mabel, Mabel, Tiger Trainer,” the film was screened last Tuesday night before an audience of invited guests at the Museum of Modern Art in mid-town Manhattan. Worldwide rights for “Mabel, Mabel, Tiger Trainer” were recently acquired by Cinema Libre Studio. The film will be released domestically on DVD and streaming platforms (Amazon and Vimeo) beginning April 10. We caught up with Zemeckis for a brief interview shortly before the 6:00 PM New York screening. Thanks to the impenetrable jungle which passes as New York City traffic, Leslie was running a little behind schedule. So we jokingly pounced on her when she walked through the door. BPE: Why are you so late? Leslie: (laughing) Why am I late? It takes time to put tiger clothes on! BPE: Well, you look grrrreat! BPE: Please tell us a bit about the film. 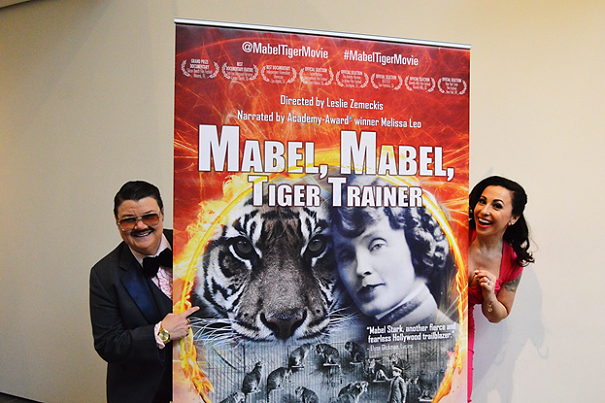 Leslie: It’s about the world’s first female tiger trainer, Mabel Stark. I make documentaries because I think they are one of the most powerful forms of storytelling. I think they are portals to other times and transport us to places where we otherwise could not travel. Tonight, the audience will travel back 100 years to meet Mabel Stark, who has an astonishing story. Not only was she the world’s first female tiger trainer, she did an act that no man has ever done or would dare to do. She was told no woman could train tigers, and she proved them wrong. She didn’t let her age or her gender stop her. I hope her story inspires others. BPE: How did you learn about Mabel Stark? Leslie: Through all of my Burlesque research. You know, my first film was Behind the Burly Q. My second film – Bound by Flesh – was about the circus sideshows. Mabel weaves throughout both of them as a carnival cooch dancer, so her name came up, and I just became fascinated by her story. BPE: So, there is that Burlesque connection? Leslie: Yes! I say all roads lead back to Burlesque. BPE: Was she doing Burlesque and the circus simultaneously? Leslie: No, she did the Burlesque very briefly in the carnival. The carnival supposedly made its way out to California, where she saw Al G. Barnes’ circus in winter quarters. There she saw a tiger and fell in love. She got into the circus to do tiger training, but her dancing was gone by then. BPE: What surprised you the most about Mabel? Leslie: One was the fact that she was told she couldn’t train tigers because women couldn’t. She just said, ‘Well, I’ll prove it to you.’ I really thought this was going to be a story about courage and what it takes, but it ended up being a story about love – about love for these tigers, and that really surprised me. Mabel Stark and Mae West. BPE: That strength of character seems to fit the overarching theme of your work in exploring the lives of extraordinary women. Leslie: Yeah, Mabel, like everyone else I’ve done, were huge stars in their time. I mean, everybody in America would have known who Mabel Stark was. She made headlines at the time; she doubled for Mae West. And then to see how their stars fade, and nobody knows who they really were. I like really digging into the histories to shine the light back on women like Mabel. BPE: Was Mabel a happy woman? Leslie: I think she was a satisfied woman. I don’t think she was really happy. BPE: She got this satisfaction from what she did with the tigers? Leslie: Absolutely. I mean, she loved them. She took total control of them. She cut the meat, she cleaned the cages, and she was a star – she didn’t have to do all of that. But they meant everything to her. Everything. BPE: Do you think she also took some satisfaction in doing something a woman had never done before? Leslie: Absolutely. One, in being told she couldn’t do it; and two, in how well she did it. 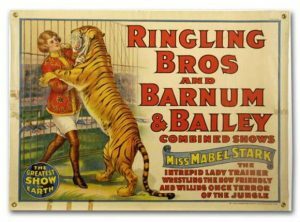 BPE: Mabel was a fixture at Jungleland and she performed in the circus? Leslie: Yes, she was at Jungleland for about 30 years and toured with many, many circuses. She started in 1911 and retired in 1968, so she had a huge, long career. BPE: What challenges did you encounter in telling Mabel’s story? Leslie: One of the most challenging aspects is that all of my films are from the performer’s point of view, and I wanted the audience to feel what it is like to be in the ring with a tiger. I called some current cat trainers, and we put cameras on them. So you have an idea of what they are seeing, when they step into a cage, and a tiger is that close. BPE: Given the changes in our time – particularly as it relates to circus animals – could Mabel be a star today? Leslie: You know, we’re living to see the end of circuses with animals, so that’s a difficult question to answer. But Mabel was an innovator and a groundbreaker. She was all about this kindness method of training, which centers on talking the animals through the act. BPE: Is that kindness method something trainers after Mabel have keyed onto? Leslie: Absolutely, and following the circuses we followed (while making this film) that’s certainly what I saw. BPE: It’s one thing to learn her methods, but do modern-day trainers know who she was? Leslie: Yes, they all know her. She’s an icon. She’s a name that people in the profession would hear and say, “Oh my God! I’m so glad you are doing this.” She’s really looked upon highly. BPE: What’s next for Leslie Zemeckis? Leslie: Well, I have a book on showgirls, which is coming out in October. I need to finish that up. BPE: Showgirls? But of course!